Retail $16.99 SAVE 6% ! Molded in blue and clear. Chrome and black vinyl tires. Displayable engine block and stand. this kit look&apos;s nasty in a good way. has a sinister stance and just has that lean and mean vibe. nice fat slick&apos;s on the rear. an engine block and stand for display. molded in blue with no flash and sharp detail. chrome part&apos;s are clear and crisp and just pop. this is an impressive kit and im a ford man. but i will give this 2 thumb&apos;s up. if you are a chevy fan, or just like mean street rod&apos;s, you have to get this one. 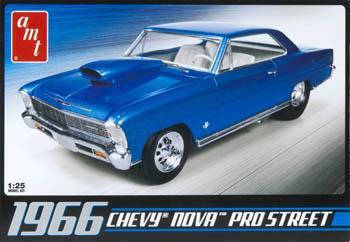 "1966 Chevrolet Nova Pro Street Model kit from AMT"